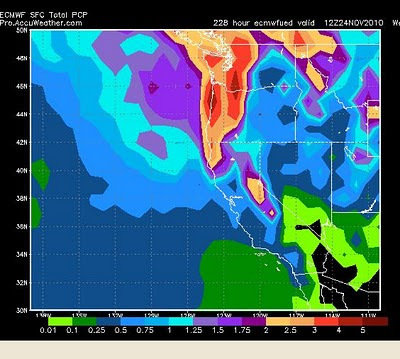 This should translate into 2-4 feet of snow for the mountains and resorts around Lake Tahoe. That might be enough to open a lot of terrain at Mt. Rose. In addition, this model is calling for at least an inch of precip down in the leeward valley's of the Sierra, which includes both Reno and Carson City. For those of you traveling on Thanksgiving, I will post a Thanksgiving weekend forecast later this week. For now, Thanksgiving day looks nice, but another storm could move in toward the end of the weekend.